When Robert Murray and Chef Gary Langevin met it was kismet. Like an Italian Nonna, gently stirring her sauce, fate began putting together the ingredients for a sublime Italian eatery, spinning a tale that began in Naples, Italy and has come to its delicious conclusion on Hilton Head Island. Langevin grew up in Naples where his mother owned a restaurant and his grandmother taught him to make Spaghetti Carbonara to satisfy his after-school appetite. Coming to America and eventually settling in Charleston, Langevin and Murray met, and the idea to collaborate on a Hilton Head restaurant began to simmer. Imagine Nonna peering into her sauce, adding all the right ingredients, like Murray’s years of business and restaurant acumen, Langevin’s Italian soul and passion for its food, and finally Chef Guiseppe Galone (aka, Pepe), another Naples native, who began perfecting his culinary artistry in his family’s restaurant in the old country. Murry, Langevin, and Galone formed Hilton Head Restaurant Group (HHR Group) where, “Bob is our president, and Pepe and I are the generals,” Langevin said. 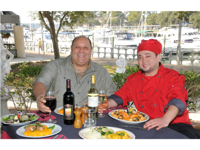 Their first foray into the island’s restaurant culture, La Fontana Waterfront Grill & Pizzeria at Shelter Cove Harbour, gives guests a front row seat at one of the best harbor views on the island, with the performance stage (after stage where Shannon Tanner performs nightly during summer months) just off their port bow. Renovations to both the interior and outdoor patio and bar area create an Italian eatery where authenticity permeates the atmosphere. While Galone and his team make magic in the kitchen, Langevin warmly greets guests with his smooth baritone voice, singing along with the classics, occasionally breaking into his own renditions. A mellow cross between Satchmo and Sinatra, Langevin doesn’t take long to acquaint himself with his “family” of guests, giving bear hugs wherever they are welcome. My evening at La Fontana began and ended with one of Langevin’s hugs, and what came in between was nothing short of spectacular. “We make authentic Italian food from authentic Italian people,” Galone said, with a passion in his eyes that lets you know this is going to be something special. My evening began with a personal demonstration of how to make Naples own Pizza Margherita. As I watched Chef Pepe throw the dough into a nearly perfect round, a little voice whispered in my ear, “This pizza is being made by the very ancestors of the place where pizza was born.” Chef explained that the perfect pizza is simple: the perfect dough, the perfect sauce, and the right quality cheese. Sounds easy enough … ha … I will leave this to the experts. Topping the dough with a simple tomato sauce and La Fontana’s homemade Buffalo mozzarella, then into the stone and brick pizza oven for a 600-degree bath, Chef Pepe gently fanned the finished pie until just the right temperature was reached to slice it. Perfection. I would have gone home with a contented feeling if my evening had ended in the cozy pizza side of La Fontana; however, it did not. What followed was a tasting created by Chef Pepe of some of the most delectable dishes from his kitchen and a perfectly paired wine selected for me by Chef Gary. The starters included crispy calamari, crab-filled mushroom caps, an expertly grilled lamb lollipop, and a lightly-dressed Caesar salad with homemade croutons and shavings of Romano cheese. My attentive waiter Kevin deftly cleared what little was left and informed me of my impending next course. I wasn’t sure it could get any better. Honestly, what came next was the best plate of Italian food (and quite possibly, any food) that I have ever eaten. A trio of excellence: saffron risotto, pappardelle pasta with basil pesto, and rigatoni with Italian sausage and roasted peppers in a garlic red sauce. The three pastas were cooked al dente, but the truly amazing part was that they each required differing degrees of texture, and remarkably, were each exactly as they should be. The peppers and sausage were richly flavored; the risotto was creamy and had a special depth of flavor; but it was the pesto that was transformative. Creamy and rich, in combination with the pappardelle, it melted on my tongue. Finally, Kevin unmercifully delivered a gorgeous trio of desserts that included a perfectly ripe chocolate dipped strawberry, a profiterole filled with the lightest white cream and smothered in chocolate cream, and a cannoli that was crispy and creamy and the perfect finale to an extraordinary Italian evening. 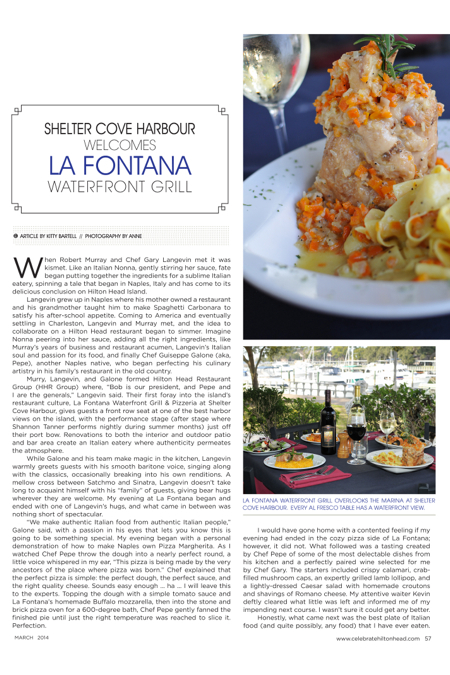 La Fontana Waterfront Grill and Pizzeria is located at 13 Harbourside Lane, Shelter Cove Harbour. Open Monday-Friday, 4-10 p.m., Saturdays 4-11p.m. Open for lunch beginning March 3. For reservations or more information, call (843) 785-3300 or visit online at www.lafontanahhi.com.